The subfloor or wall must be structurally sound, rigid, smooth, flat, and free of curing compounds and waxy or oily films. Depending on your existing subfloor or wall, you may need to install a backer board before installing your medallion. The back of the medallion is made with aluminum, roughly pre-sanded at the factory to insure good adhesion. Insure the backer is clean. 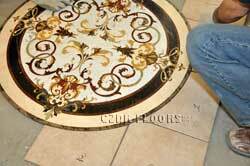 Remove protective rubber edger from the medallion. Transparent protective film on top of the medallion can be removed after installation. Square off the area where the medallion is to be installed and measure and mark centers of the area both ways. Use a chalk-line or marker to install intersecting lines through the center of the area. This will divide the area into four parts. Dry lay the medallion and surrounding tiles. Mark the tiles around the medallion with numbers. Mark the curve cut line on tiles. Using grinder cut the tiles to the shape. Dry fit the cut tiles in the same numbered positions and make adjustments for proper fit. Remove any remaining packing material from the medallion. If your medallion is in more than one piece, assemble it in an out of the way area to familiarize yourself with the way it will fit together. Remove the protective rubber edge off the medallion. Medallions up to 70" can be made in the single piece. Larger medallions are shipped in several pieces for easier handling and installation. The pieces are numbered or lettered on the back for easy assembly. Note that medallions sometimes may slightly warp during transportation. The solution is to lay the medallion flat and weight it with sand bag or similar overnight. 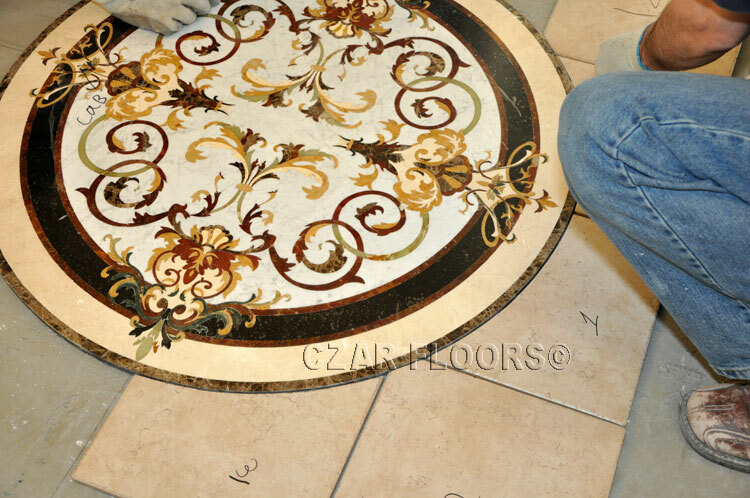 We recommend using a Marble Set or Thinset Adhesive for the Floor Medallions. Laticrete made mortars are good example. We recommend using a 1/4 to 3/8 inch Square notched trowel for the larger floor medallions and a 1/8 inch V notched trowel for the backsplash medallions. Using the intersecting lines as a guide, apply the thinset or adhesive. Spread one coat using the flat side of the trowel and then immediately come back with second coat, using the notched side of the trowel. Place the medallion in the thinset and press it into place lining using the intersection lines as guides. Use a wood block or grout float to press the medallion firmly into place taking care to adjust and level to get a smooth finish. Also any part of the medallion that are low in the floor or wall may be raised by inserting extra thinset or adhesive under the medallion. Apply thinset to the cut tiles and insert them taking care to adjust for level and smoothness. Using a damp sponge to clean any adhesive residue from the medallion and the joints. 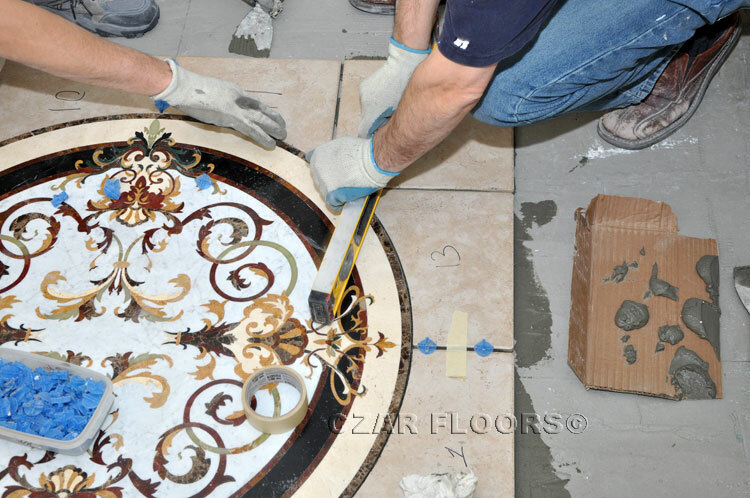 Stone Floor Medallions should be sealed after installation with specialized penetrating stone sealer. This is true for any type of stone installation. Sealer should be periodically reapplied at least once every two years. A good sealer to consider is "Miracle 511 Impregnator" sold in Home Depot. Clean marble surfaces with non Acidic, low-pH specialized stone cleaners such as Mira Clean #1 by Miracle Sealants. Do not scrub it with a brush or any other scrubbing tool. Vacuum often to remove any grit. For Emperador Dark and Emperador Light damages, if there is a piece come off, put the original piece back, crash a stone of same color (if you don't have emperador dark or light, get some broken tiles or chair rails for this purpose) . Look around the crack and see what is the natural size of the color pieces around the crack. Choose similar sizes to fill into the crack (make sure to use mixed sizes and use some very fine pieces or even powder to fill very small gaps too). Before putting the stone pieces into the crack, mixed the pieces with very small amount of epoxy (just enough to wet all the pieces.) After the stone pieces are dry in the crack, polish the area with a small hand held polishing tool. A good repair should be almost invisible. For crema marfil, crash a small piece of crema marfil into size of 1/4 - 1/2 of a rice (use some very fine pieces and powder too). Mix the pieces with very small amount of epoxy, fill in the crack and polished. Again the repair should be almost invisible. A common mistake is to crash the crema marfil into powder and fill the gap with powder. After repair, the crack will still be visible (somehow the powder will loose some color and become too light). You must use some mixed size pieces (size similar to broken rice). If it is “hair line"cracks, just fill it with clean epoxy (use razor blade to go back and forth around the cracks to work the epoxy into cracks), clean the area with razor blade as soon as the epoxy started to dry (when the epoxy is no longer liquid, feels like a rubber, but not totally dry yet - this is the time that is very easy to clean with blade.) No polishing is necessary. 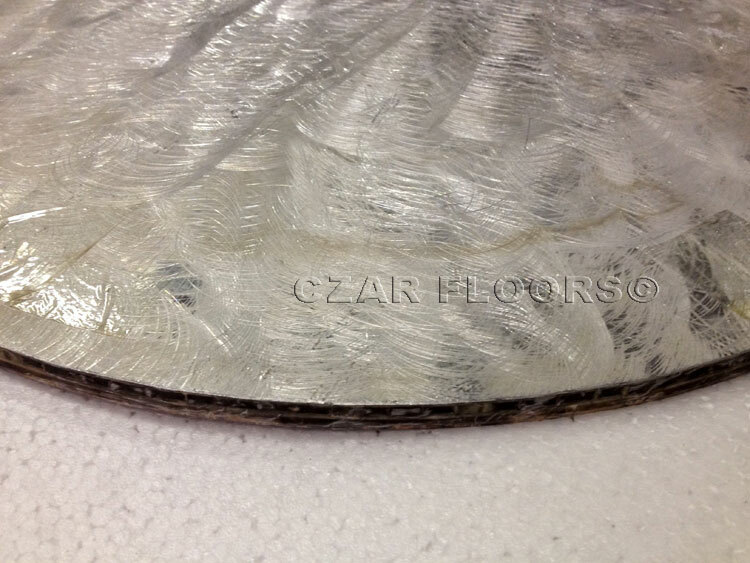 When the clear epoxy dries, it will look like natural crystal lines that exists in crema marfil. Some people do mix yellow color into the epoxy to get better result. But matching the color of crema marfil will require some experimenting. Do not put in hardener (usually the less clear part in the 2 part epoxy) until you are satisfied with the color. 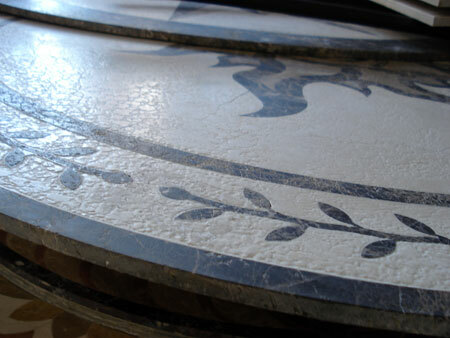 You can request different types of treatment for stone waterjet inlays when placing an order. Standard marble medallions are factory polished. In some circumstances you may wish to have a more slip resistant surface (i.e., in the bathroom). 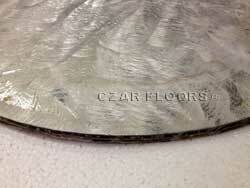 In this case, please request "honed" surface for marble medallions. 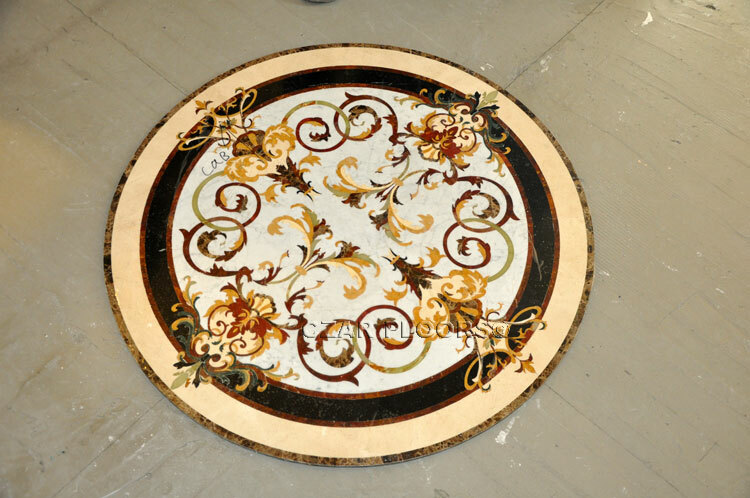 Stone Medallions can also be treated at the factory to have a "tumbled" appearance as shown on the photo below.